The Healthy Incentives Program connects SNAP to farmers’ markets and boosts the local economy. Vanessa Jimenez loves turnips tossed with olive oil and roasted until they’re soft and sweet. She loves the lemony tang of sorrel leaves and the nutrients packed into celery root. And she really loves it when fall rolls around and her local farm in Northeastern Massachusetts offers up honeycrisp apples bigger than any she’s ever seen. Jimenez’s passion for produce began around the time that her epilepsy started to keep her from working and she found herself signing up for Supplemental Nutrition Assistance Program (SNAP) benefits, formerly known as food stamps. 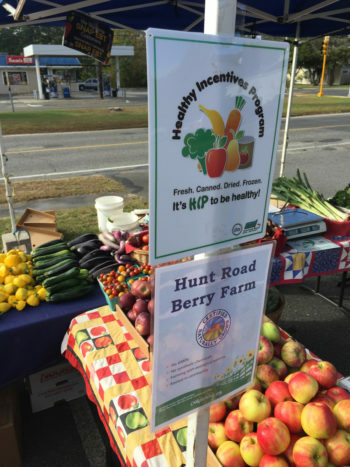 In the process, she was automatically enrolled in Massachusetts’ Healthy Incentives Program (HIP), a pioneering initiative that gives low-income residents extra money to spend on locally grown fruits and vegetables. At first, she found it hard to believe the program could really work. But then she bought $43 worth of produce at a nearby farm and saw her SNAP account was only down $3. HIP launched in 2017 with the dual goals of improving low-income households’ access to fresh, local produce and helping boost business for the state’s farmers. At a time when food benefits for low-income people are the subject of ideological political jockeying in Washington, D.C., HIP represents the possibility that a program can garner bipartisan support while helping both low-income families and the economy. “It’s such a great program and we’ve had such a great coalition—it’s proven that it works,” said Winton Pitcoff, executive director of the Massachusetts Food Systems Collaborative, the organization tasked with implementing the state’s local food action plan. Programs that match spending on healthy food have been around for a while. Nonprofit Wholesome Wave, for example, in 2008 began working with farmers’ markets and grocery stores to double the value of SNAP spending on fresh produce. The Fair Food Network launched a similar program called Double Up Food Bucks in Michigan since 2009 that has since spread to 26 states. However, HIP is the only one so far to electronically apply the credits to participants’ SNAP accounts. This small procedural difference makes taking advantage of the program a simple proposition for consumers, who don’t have to keep track of the coupons and tokens many other programs use. This ease of use might account for the immediate popularity of the initiative. During the program’s first full year of operation, more than 70,000 clients received HIP benefits, with a total of $4.6 million in fresh fruits and vegetables going to low-income households. In fact, the program caught on so quickly that in just one year it tore through a budget that had been slated to last three years; the state legislature had to approve an additional $2.15 million to finish out the fiscal year. 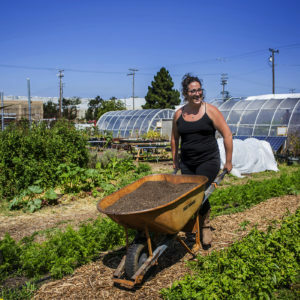 “What I’ve seen is people empowered to buy food they might not be able to afford otherwise,” said Hazel Kiefer, an urban agriculture manager for nonprofit farm The Food Project. At the same time, farmers and farmers’ markets have reported soaring sales. At the farmers’ market in Lynn, one of the state’s lowest-income cities, The Food Project saw twice the sales in the first two weeks of the season in 2017 as compared to the same period the previous year. And the 2018 market has nearly maintained this pace, Kiefer said. Laura Smith, a farmer who operates Lane Gardens and Oakdale Farms in Southeastern Massachusetts, was startled by the surge in sales at the 11 markets she attends. To meet demand, she bought more seeds and hired more help, and which also contributes to the local economy. And she watched with pleasure as, increasingly, customers at the markets she attends built a sort of fellowship, swapping recipes in line and encouraging their children to help choose produce. “What has really touched me is the way that each farmers’ market has built such a community of people coming each week to purchase fresh fruits and vegetables,” Smith said. Here’s how it works: Anyone who receives SNAP benefits is automatically enrolled in HIP. When participants use their SNAP benefits to pay for food from a HIP-qualified farmstand, mobile market, farmers’ market vendor, or community-supported agriculture program, the money they spend is automatically credited back to their account, up to a monthly limit. Households with one or two members can get up to $40 back, those with three to five members get up to $60, and larger households get up to $80. The seeds of HIP were planted in 2011, with a federally funded pilot program in Hampden County, a Western Massachusetts region that has some of the lowest incomes in the state. In that case, participants received 30 cents back for every dollar spent on fruits and vegetables. 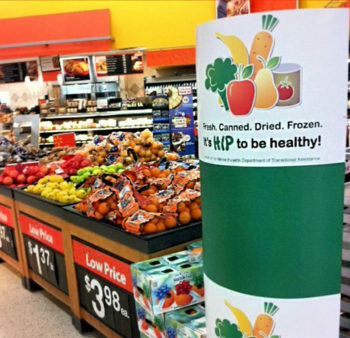 The final report on the pilot showed that it made a significant difference in participants’ consumption of healthy food: Those who received the incentive consumed 26 percent more fruits and vegetables than those who did not. Encouraged by these results, the U.S. Department of Agriculture (USDA) launched the Food Insecurity Nutrition Incentive (FINI) program to award grants to similar initiatives. Massachusetts applied in the first round and in 2015 was awarded $3.4 million—one of the largest grants given—to establish HIP; the state provided another $1.35 million in last year’s budget. 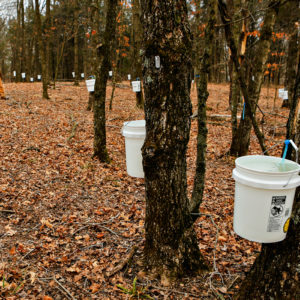 In total, $31 million in grants was awarded that year, to projects in 26 states—some statewide, others focused on certain regions or counties. As HIP works its way through its second year, however, challenges remain. First there’s the question of software. Novo Dia, a company that provides benefits processing software to approximately a quarter of the country’s farmers’ markets, announced earlier this year that, due to lack of support from the USDA, it would terminate its service at the end of July, leaving 1,700 markets with no way to process benefits payments. The National Association of Farmers’ Market Nutrition Programs has said it will provide funding to keep Novo Dia going through August, and New York state recently announced an agreement with the company to keep its services operational for the near future, but a long-term solution has not yet emerged. Furthermore, funding remains a perennial issue. When the program used up its initial budget in April, it was suspended for five weeks until the legislature approved additional money. For the current fiscal year, which began July 1, the legislature has approved $4 million for HIP, and Governor Charlie Baker signed the budget containing that funding into law on July 26. But program advocates still doubt the sum will be enough to meet demand for a full year. Lawmakers have been unanimously supportive of HIP, Pitcoff said, but there is a limit to how far the state’s annual budget can go. As the program faces an uncertain future, advocates, farmers, and especially clients are hoping it becomes a sustainable, long-term endeavor. 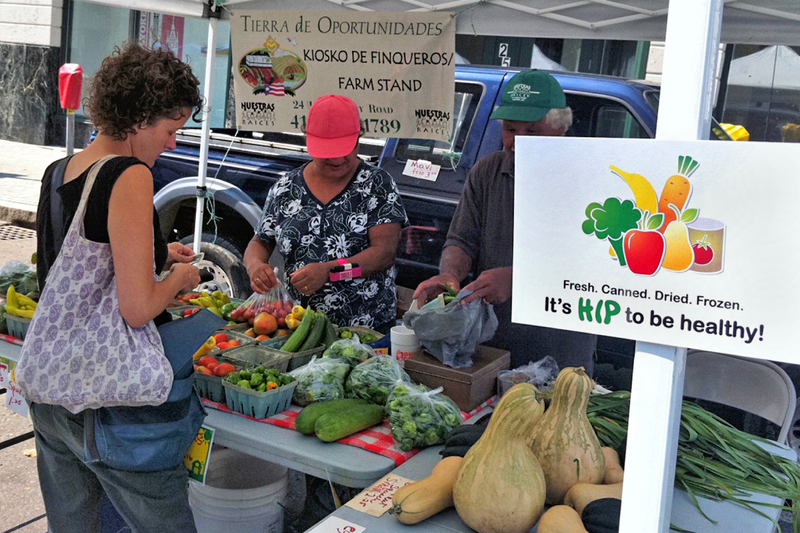 For Jimenez, HIP has been about more than just buying healthier food. It’s about going deeper on health and nutrition and becoming more engaged with her local food system. “I can’t believe I actually get money back for supporting my community,” she said. Top photo courtesy of Massachusetts Food System Collaborative. I wonder if there's as much fraud in MA Farmers Markets as there is in some other states. 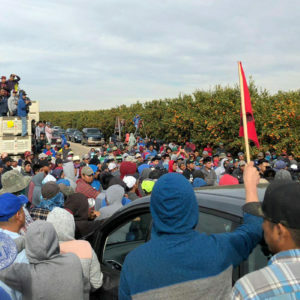 Vendors bulk buying and reselling, falsely labeling conventional produce as organic, "farmers" coming from great (non-local) distances for the business, etc. It seems like programs like this would encourage that behavior even more. I train folks to freeze and vacuum pack individual foods that then combine to become stir fry meals, soup kits, fruit sauces, fruit desserts and quick bread kits that teach people how to cook. Cooked dry beans and cooked whole grains plus savory sauces inspire meals that please dietitians and eaters. I want to share what I do. I am a retired family and consumer science teacher, farmer and community scale food processor.